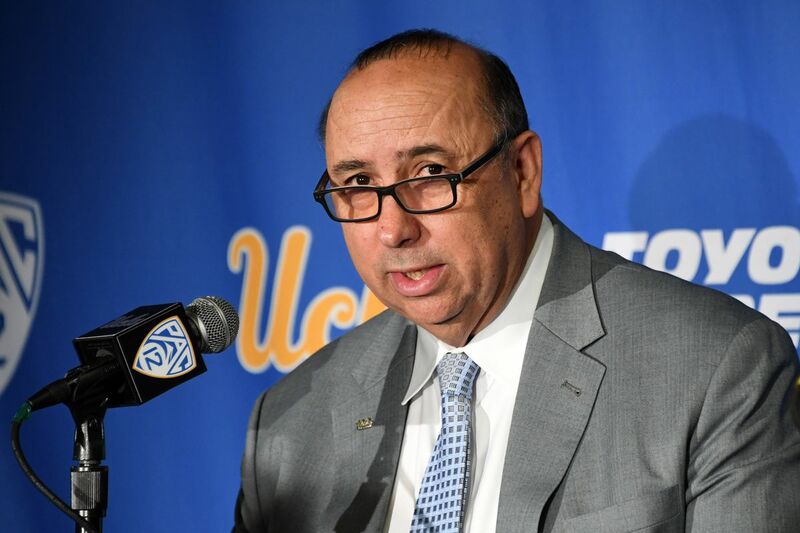 Yesterday, Dan Guerrero mentioned that he’s discussed a contract extension with UCLA Chancellor Gene Block. The 100th day of UCLA’s coaching search brings good news: Tony Bennett and Chris Beard are now available to talk, but will it matter? I would like off of Mr. Guerrero’s wild ride, please. Is UCLA About to Lose Yet Another Coaching Candidate? If UCLA cannot land Rick Barnes, they will have missed on (at least) three candidates. According to one report, Dan Guerrero expected to hire Jamie Dixon on Thursday. That deal now looks to be dead because UCLA refused to pay Dixon’s buyout. Is Panic Starting to Set in at UCLA over Hiring of a New Basketball Coach? An arbitrary timeline to hire a coach "within the next week" makes it look like the Bruins are repeating history and expecting a different result. Seth Davis is reporting that UCLA offered John Calipari a 6-year contract worth $48 million, which he has declined. A report has mentioned that UCLA has interviewed Earl Watson for its open basketball head coaching job. The question is "What has Watson done to merit that?" The answer is: ABSOLUTELY NOTHING! Today, Guerrero issued his first statement since the college admissions scandal broke last week. Salcedo has stepped down as the Bruins men’s soccer coach. Full coverage of the Operation Varsity Blues college admissions scandal which included the indictment of UCLA men’s soccer coach Jorge Salcedo. An email was sent to members of the greater UCLA community. UCLA and UCLA Athletics has released the following statement on the admission scheme that has resulted in the indictment of men’s soccer coach Jorge Salcedo. UCLA has placed Salcedo on leave after he is one of dozens of parents and coaches charged in a new college admissions and testing scheme. The $35 million building got a kickstart thanks to Mo Ostin. A lot of Bruin fans are understandably upset. They want blood and they want it now. They aren’t content with firing Steve Alford. They want Athletic Director Dan Guerrero fired, too. How likely is that? Let’s take a realistic view of the landscape. Will a Lack of Leadership Doom the UCLA Basketball Coaching Search? What About Hiring a Woman? May you and your family have a very happy holiday! There are serious problems with the Pac-12 Conference leadership that must be fixed moving forward. UCLA’s chancellor joins Twitter and Bruin basketball fans instantly start demanding Steve Alford be fired. Has Steve Alford Given UCLA Grounds to Terminate Him For Cause? Do the Bruins finally have a way to get out from under Alford’s contract without giving him a huge payday? He doesn’t want to be here and no self-respecting Bruin fan wants him here either. Ouch! 98-year-old nun drops the mic on the Bruins head coach. Alford made a promise to UCLA fans that he failed to keep. How has UCLA Football recruited since Dan Guerrero became Athletic Director? The results may surprise you. Stanford has once again taken sole possession as the school with the most NCAA titles. Some photos from yesterday’s press conference. Kelly’s first presser checked all the boxes and it was even amusing at times. While UCLA announced Kelly’s hiring on Saturday, his introductory press conference will be held this afternoon. SMQB: What Does the Hiring of Chip Kelly Mean for UCLA Football? A look at how Kelly’s hiring will impact the Bruins. The Chip Kelly hire shows that UCLA is "all-in" when it comes to football at UCLA. Kelly will be introduced on campus on Monday.